The term current assets will represent all the assets of the firm that are expected to be easily sold, utilized, consumed, or exhausted through the company’s or standard business operations which can lead to their conversion into cash value within the single year. 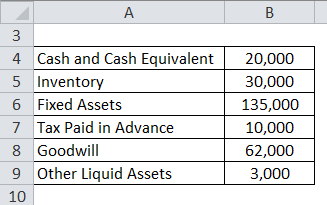 Current assets in the face of balance sheet shall include the following: cash, accounts receivable, cash equivalents, marketable securities, pre-paid liabilities, stock inventory, and other liquid assets. 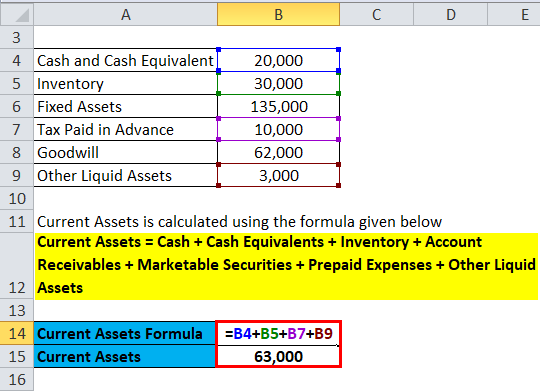 Let’s take an example to understand the calculation of Current Assets formula in a better manner. Following is an extract from ABC company Ltd which it has filed with regulators, let’s try to figure out current asset value from it. Note: Fixed assets and goodwill will not form part of current assets as they are long term assets. Following is the extract of assets total from google annual report as of 2016. 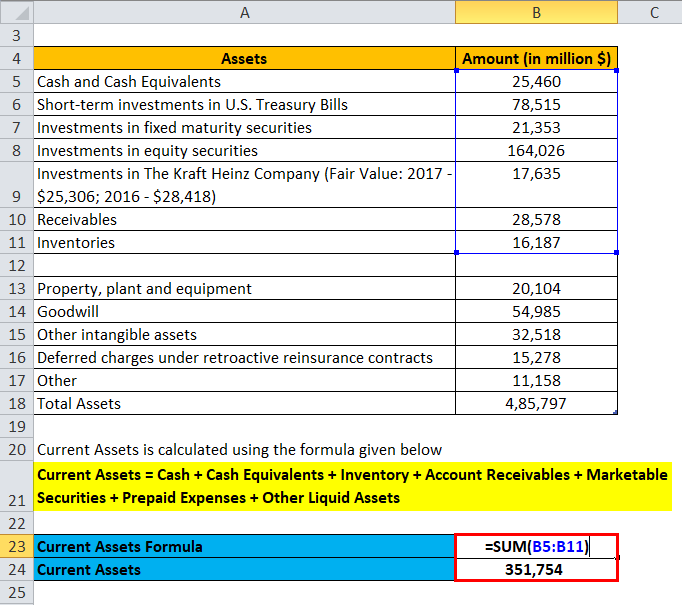 Let’s try to figure out the total of current assets. Excluding the long term assets like Property and equipment, Intangible assets, Non-marketable investments, goodwill, deferred income taxes and other non-current assets will yield us the current assets figure. 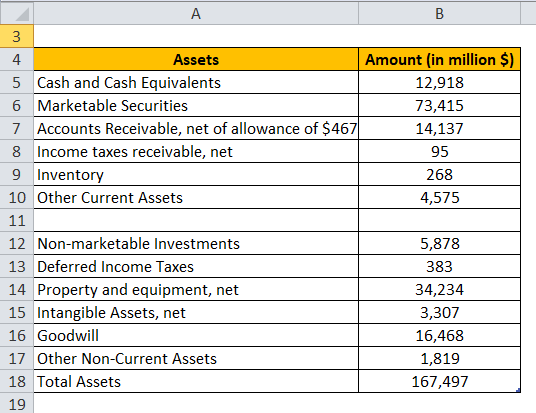 Coming to the second practical example, we have extracted asset data from Berkshire Hathaway Inc. annual report filing which is under 10-K. 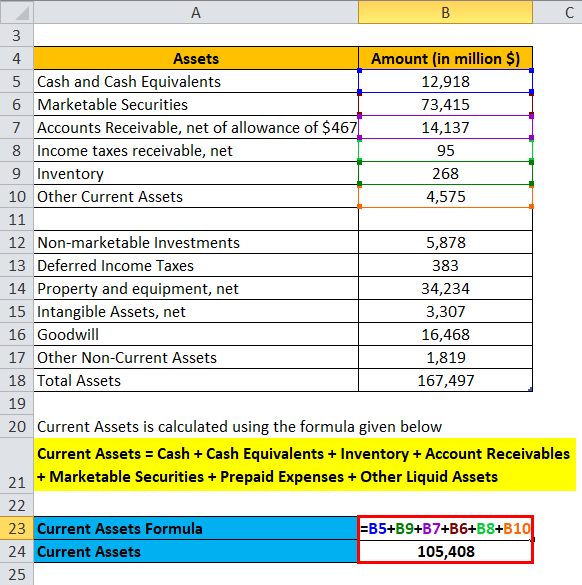 Calculate its current assets. Here again, we would include only assets that have a life of 1 year and not more than that. Hence we have excluded Property, plant and equipment, Goodwill, other intangible assets and Deferred charges and others. Current assets are all the assets of the firm or of the company which are expected to be conveniently consumed, sold, utilized or exhausted through the standard company or the business operations within the next single year. 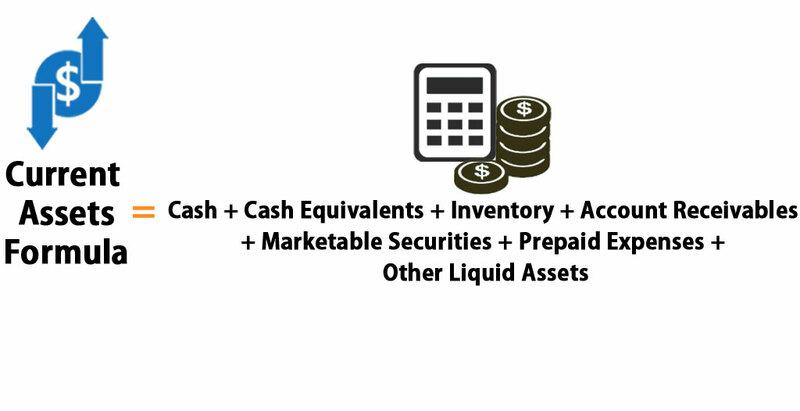 Current assets shall include stock inventory, accounts receivable, cash, cash equivalents, pre-paid liabilities, marketable securities, and other liquid assets. These are the key assets that form the base of the current assets. There is no exhaustive list of current assets which can give but 80% of the company’s current asset will compromise the above-mentioned things. 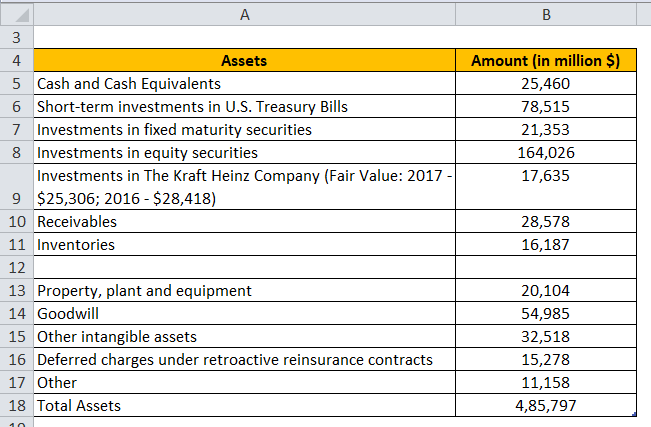 One needs to make the judgment as to if the company is expecting to realize value from that current assets within the year then it should be grouped under current assets. Current assets are important to the company or say to the businesses because those current assets can be used to fund daily activities or the day-to-day business operations and are also helpful in paying for the ongoing and recurring operating expenses of the company. As payments towards loans and bills become frequently due at regular intervals (say at the end of each month), the management or the company must be able to arrange for the necessary or say for the required cash in time to pay for its dues and obligations. The dollar value which is represented by the current assets figure will provide a general insight into the firm’s or the company’s cash and of the liquidity position, and it shall allow the company or the management to remain prepared for the required or the necessary arrangements so as to continue its business operations without any hiccups. Additionally, investors and creditors do keep a close eye at the current assets of the firm or of the company to assess the risk and the value that is involved in its operations. Many of them will make use of a variety of ratios like the liquidity ratios, which shall aid in determining a debtor’s ability to pay off its current debt obligations without raising any outside or the external capital. Such commonly used ratios include the figure of current assets, or its components, as the main ingredient in their calculations. How to calculate Markup Price?